Richard Starkey, better known to the world as Ringo Starr, drummer for a little dance band from Liverpool, England who called themselves The Beatles, was born 70 years ago today on 7 July 1940. Many people called him 'the luckiest man on earth,' as if he merely climbed on board a speeding train and went along for the ride. But it took a special kind of drummer - and personality - to complement the immeasurable talents of John Lennon, Paul McCartney and George Harrison. 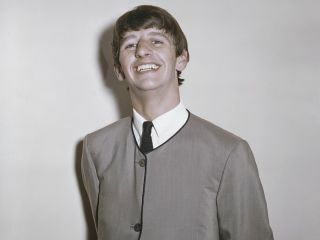 Fact is, Ringo, born left-handed but self-taught to play righty, and one of the first players to popularize the matched grip, was the perfect choice for The Beatles: He didn't just play beats; he played songs, approaching his drum patterns as musical compositions, full of quirky, funny, sightly off-kilter hooks that became embedded in the fabric of what is perhaps the greatest and most enduring catalogue of music in modern history. Oh, yes. He also inspired, on the night of 9 February 1964, sitting high atop his Ludwig kit during The Beatles' first appearance on The Ed Sullivan Show, more people to pick up the drumsticks than any other drummer. Ever. The biography of Ringo Starr could fill a book; in fact, many have been written, and surely more will follow. The factoids are out there for anybody who wants to seek them out. But on this, Ringo Starr's 70th birthday, MusicRadar celebrates the musician, the drummer, a peerless one at that, with some of his finest performances. Because some Beatles footage doesn't adequately focus on Ringo behind the kit - and during the mid-'60s, as the group became a studio-only enterprise, some songs weren't shot at all - we've opened up our video gallery to include YouTube clips that feature some stellar and damn near note-perfect drum covers. All show off the magic, and lasting influence, of Ringo Starr, MBE. The Beatles' first real concert in the US was a riotous affair, one that tested the patience of the city's police force and the skills of the band's limited road crew. Realizing they were now conquering the continent they had only dreamed of, The Beatles put on a rip-roarin' rock show. And for those who might still think of Ringo Starr as a laid-back sort, his head bobbing from side to side, these three clips are proof-positive that the man could bring it big-time. Another knockout. Ringo is pounding rivets here, but he adds some tricky flams in the chorus. No mean feat when pandemonium abounds. A singing drummer! Long before Levon Helm, Don Henley and Phil Collins, Starr rocked the mic - and still managed to slay the skins. The Beatles' first number one hit had all the right stuff - an infectious melody, exuberance and yearning vocals - including a well-thought-out drum progression that matched the song hook for hook. Ringo's spunky fills that accented every "Come on, come on!" aren't as easy as they might seem, as this cover version by Batmankozyy proves. Released at the end of 1964, I Feel Fine - famous for its feedback intro, which many contend is the first of its kind on record - featured some of Ringo's most tasteful drum work. His quasi-Latin rhythm, accented on the tom with the ride cymbal played on the bell throughout the verses, gave the song its unique flavor. One of Starr's most inventive patterns, and one most drummers get wrong. Here he's not playing a typical backbeat, it's more syncopated. Check out how he varies his snare-tom lick at the end of the second chorus - that's the part everybody misses. A brilliant device that flips the dynamic around. Lennon was blossoming as a reflective songwriter, and Ringo was right there with him, with a performance that seemed to underscore the weight of the lyrics with wildly imaginative and varied snare fills. Batmankozyy nails Ringo beat for beat. Lennon challenged producer George Martin with the idea that a song could be based around one chord. Score one for John here. But it was Ringo's steady-as-a-rock drum pattern (the kick is on the 1 &3 throughout) that made the song truly hypnotic, psychedelic and unforgettable. Long before machines provided perfect, unwavering beats, Starr had them all licked. Rhythmatic does a stunning job of re-creating what was a milestone in drumming. Released as the B-side to Paperback Writer, Rain, a simple Lennon mantra, is said to be Ringo's favorite drum performance. And with good reason: although many see it as utter chaos, it's a deftly plotted out composition, every snare and tom fill achieving maximum effect. Try and copy it, as Batmankozyy does...not for the beginner. John Lennon's crowning achievement from Sgt Pepper also belongs to Ringo for his remarkable orchestral fills. Phil Collins, when asked about Starr's skills as a drummer, had this to say: "I think he's vastly underrated. The drum fills on A Day In The Life are very complex things. You could take a great drummer today and say, 'I want it like that.' They wouldn't know what to do." Kudos to Marcos Camacho for his superb cover. Right when people might have thought that The Beatles had gone soft and forgotten how to rock came Lennon's anti-war anthem, which was powered by Ringo's forceful floor tom pattern. And that kick - most drummers need a double bass drum to pull off what he does with just one. The Beatles' last public performance saw Ringo prove that he was still a drummer to be reckoned with. With his kit covered in tea towels - the band had become enamored with the dampened effect at the time - he responds to John Lennon's time shifts (the chorus begins in 5/4) with precision, artistry and, when needed, outright force. Also from the Let It Be rooftop session, Ringo drives Paul McCartney's good-time rocker with a marching snare pattern that is, as always, the perfect hook/accompaniment. When it's time to hit an accent on the crash, he crashes, and when it's time to lay it down on the floor tom, he pounds like there's no tomorrow. Abbey Road is filled with some of Ringo's finest drumming. From Come Together's round-the-kit opener to the rolling fills that enliven Here Comes The Sun, The Beatles' grand finale sees Mr Starr shine throughout. However, the album is notable for a first: Ringo's one-and-only, honest-to-goodness drum solo. He hated spotlight moments such as this, but was egged on by the band to give it a go. And guess what? He rocked! Here Mike Portnoy, in one of his many cover bands, Yellow Matter Custard (which also features guitarist Paul Gilbert), does his best Ringo. And thanks, Ringo. You and the boys guaranteed a splendid time for all...and you made good on that promise. Happy Birthday!